For the final piece in this series, I wanted to include design elements and surface techniques that I’ve used in the previous pieces, to give the feeling of summarising the series. However I also wanted to include some new elements so that the piece didn’t feel like a copy. 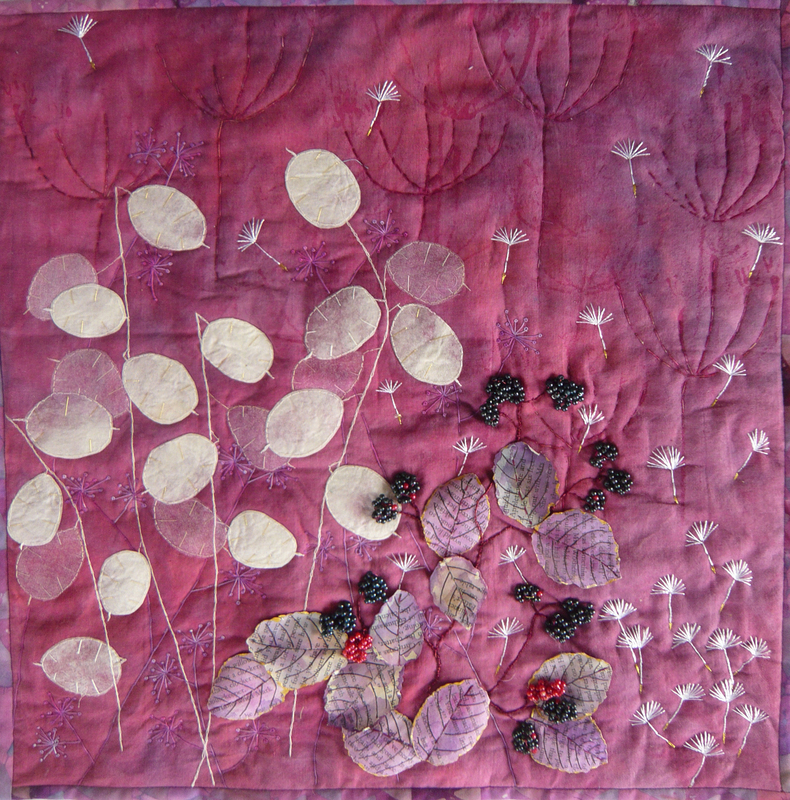 I opted to use Honesty fronds from my first piece, but this time made silk paper for the majority of the seed heads, with a few transfer dyed sheer fabric additions. I made another string block, and stamped cow parsley seed heads in the background. For the blackberry patch I dyed and painted paper shapes for the leaves, created blackberries using beads and wire, and used the same wire for the stems. 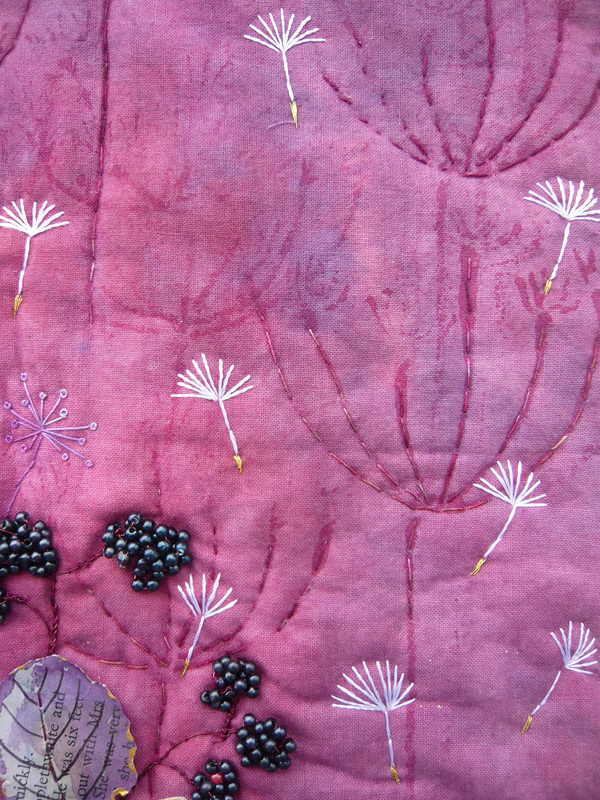 I used dandelion seeds scattered through the piece, to give the impression of having just blown away from a seed head. Finally I added some fronds of my ever-present sweet cicely heads in the background. The piece is completely hand-stitched, but I tried to keep to a fairly limited colour palette, but one which is the reverse of my first series piece. I feel that this gives a book-end effect to the whole series. I love the way that you have ‘closed’ the series with your use of previous elements. Great details and true blackberry colour! A great series! Such a nice conclusion to your series ! your work is very delicate and I also like the link between the different pieces. I like the harmony in your series! and what a great way to end it, reversed to the start of it! For a moment I thought the blackberrys were real! The silk paper makes the Honesty fronds look real. 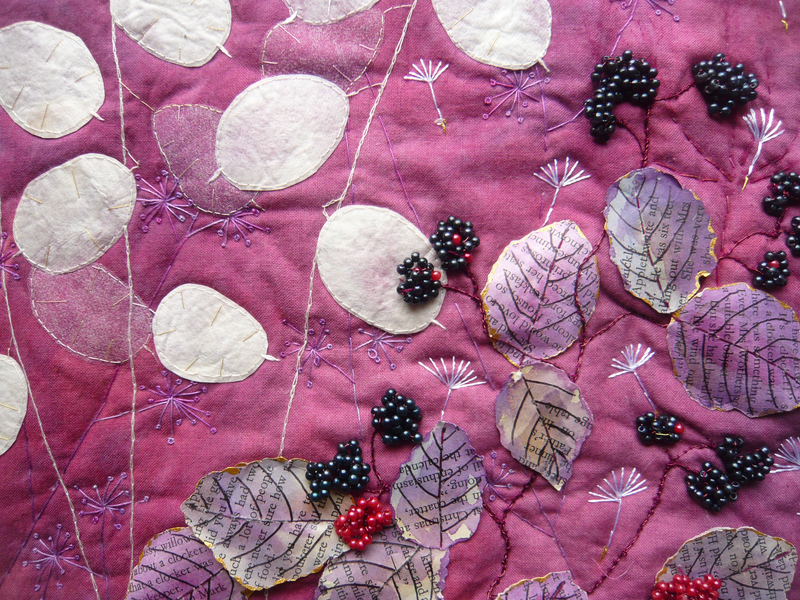 I love the blackberries and the paper leaves. You created a great series. I would love to see them in real. Joan, you made a fabulous last piece in a fabulous series. The way you manage to reach the effect of real seed heads, flowers and berries is from a real artist. Love the whole range of pieces, the stitching, colors and details, congratulations on this. I love your series very much. They are so beautiful, elegant and lot of details. I also like your use of colors. Good job, Joan. 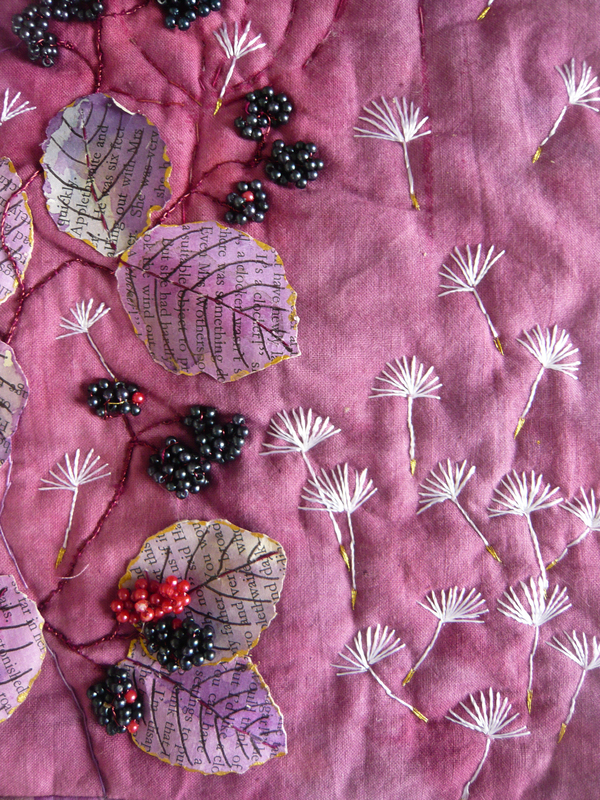 I love the blackberries and cow parsley. It is amazing that you did everything by hand. The details on the centre leaves is spectacular. You have brought your series to a close with a grand finale. Such a beautiful end of your series. I love how you have repeated the design and color of your first one for this last piece. I was wondering how you made the silkpaper for the leaves?Your whole series is so elegant amd has so much detail. Bravo. I love how your series flows together, each with its own special techniques, incredible hand stitching, fine details and color. A beautiful and delicate study Joan, well done. This is beautiful and really reflects the current season here in the UK. Your berries look edible! I love the way you have created layers in your designs.